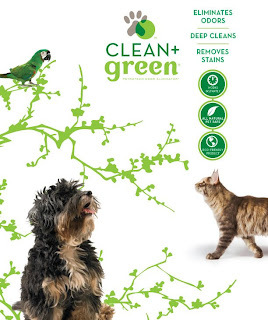 SeaYu contacted me about reviewing their new cleaning products Clean Green. Now, my husband sort of banned me from accepting anymore cleaning products, but I said yes to them before THE INCIDENT happened. So, I had to try it out when it showed up on my door because I agreed to. developed the safest, most effective, pet cleanup system you’ll find anywhere. Going to the website can be a little confusing in my opinion, but now that I have tried the product, let me explain it to you because now it makes sense. They make SAFE cleaning products, they are safe to be around pets and children. YEAH!! So you can select by animal and cleaning surface. I chose dog, for carpet. My dog doesn’t have accidents, or didn’t during my trial period, but I do have children and there are older stains on the carpet that I haven’t gotten out yet. I gave it a try, you have to clean up debris, you know, chunks and what not before you apply this stuff. If it got rid of chunks the stuff would have to be toxic. So it’s great for pee and older stains, or anything after you pick up the mess. Then shake the can and spray it on the spot. THAT’S IT. And it works. I couldn’t believe it. The spots are gone and it didn’t smell bad. I know I say I love things a lot, but I really really love this stuff. We use a Spot Bot made by bissell and the chemicals smell, I have tried spot shot and everyone in my family gets head aches. I sprayed, no smell, and the stain is gone. You can’t believe this. It’s like a miracle cleaner. I can’t believe it’s safe, and that it got rid of the stain without changing the color of my carpet. And it’s safe for my kids. I know I already said that, but my kids can crawl on the spot and I don’t have to worry about them breathing in the nasty chemicals. I’m so happy and I get to share it with you. Even better. Go visit SeaYu and tell me which cleaner you would like to try. Leave a comment for every entry and the giveaway ends April 1st. Looks like a great cleaner. We have two cats and two messy toddlers so something like that would be nice. I’ll have to check out their website. Thanks for sharing and good luck with your giveaway. The Cat Wood and Tile Cleaner would come in handy here! I’d love to try the litter box odor eliminator! I’d try the litter box odor eliminator! De-Skunk Coat Cleaner and Odor Eliminator. The DOG – Carpet & Upholstery sounds like what I need. Thank you! I’d love the dog, carpet, upholstery deodorizer! I definitely need the dog uplohstry and carpet cleaner!! the cat carpet stain cleaner! The I’d like to try the Auto Odor Eliminator, Cleaner and Stain Remover would be my pick to try. I would like to try the CAT – Carpet & Upholstery Odor Eliminator, Cleaner & Stain Remover. My cats are excellent about using their litter box, but once in a while accidents happen. I hate using the chemical-smelling cleaner and would live to try this. Thank you for the chance to win. i like the auto odor elimanator. I want to try the DOG… Carpet & Upholstery cleaner. I would like to try the AUTO Odor Eliminator, Cleaner and Stain Remover. Thanks. I would like to try the litter box odor eliminator. Gotta have the litter box odor eliminator. I like the Auto Odor Eliminator, Cleaner and Stain Remover. As a mom to 3 busy cats I would love to try the CAT – Carpet & Upholstery Odor Eliminator, Cleaner & Stain Remover for their occasional misses! I’d love to try the Litter Box Odor Eliminator. I could use the cat Litter Box Odor Eliminator. Odor Eliminator, Cleaner and Stain Remover! The Dog-Carpet and Upholstery since he has a sensitive stomach is is always throwing up on my carpet and he is a large guy! What a mess! With two cats at home, I’d love to try the Cat – Carpet & Upholstery Odor Eliminator, Cleaner & Stain Remover! Odor Eliminator, Cleaner & Stain Remover. I have three cats. Thanks for the giveaway! I could use the Auto Oder elminator and cleaner! I would like to try the Auto Odor Eliminator.